Naturopathic physicians are trained in this ancient form of medicine, which includes diagnosis and acupuncture. Acupuncture involves the insertion of small needles into the skin along meridians in order to treat disease and normalize the body. 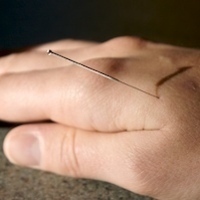 It is a very useful technique for the treatment of pain but has many other applications depending on the patient's needs. The basis of traditional Chinese medicine (TCM) is the concept of Qi flowing along invisible meridians in the body. Qi is the energy within that controls our organ functions and helps to prevent illness.